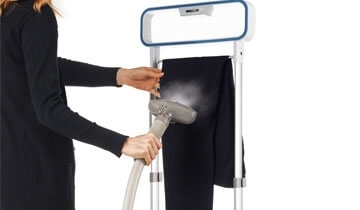 Vaporella Vertical Styler is the vertical steamer ready in less than a minute, ideal for refreshing fabrics, removing creases and also for eliminating odours from home textiles. The adjustable-height, multi-function hanger helps you to comfortably treat different types of garments and fabrics. 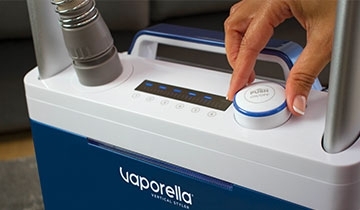 The large removable 2L water tank allows an unlimited working autonomy; the 6 steam settings make Vaporella Vertical Styler suitable for all fabrics, from the most delicate to the most resistant. 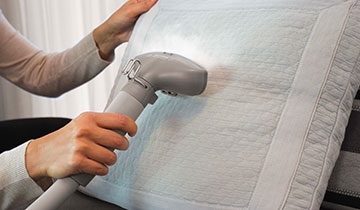 The accessory brush also helps steam to penetrate even the heaviest fabrics. 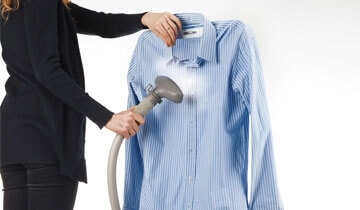 The garment steamer for an impeccable wardrobe. Vaporella Vertical Styler is the daily ally for those who are always in a hurry but still want to look impeccable. Ready in just 60 seconds, it is perfect for quick refreshing but also to eliminate creases, revive fabrics and eliminate odours, without using the ironing board or the laundry. Effective on the most delicate and difficult to iron items such as lace, embroidery and pleated fabrics, but also on jackets and coats. With Vaporella Vertical Styler you can adjust the steam according to your different ironing and fabric needs. It's the perfect solution for delicate fabrics such as silk, because it smooths the creases gently with the steam; on the more resistant fabrics such as cotton and linen you can increase the steam pressure to the maximum level and apply the accessory brush to the metal head, to make it penetrate more deeply. The Vaporella Vertical Styler's hanger is adjustable in height, for maximum comfort; solid and robust, it can hold up to 18 kg of weight. Its particular shape makes it multifunctional; in fact it's ideal for hanging jackets and coats but also for large textiles such as curtains and tablecloths that can be hung directly on the metal support. Moreover, the metal structure with double supporting tubes guarantees maximum stability. 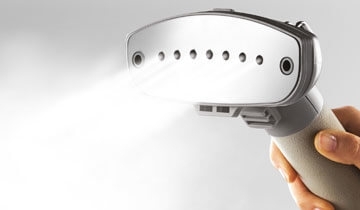 The large metal head delivers concentrated and continuous steam, promoting effective removal of the creases. The Soft Touch handle ensures a comfortable grip during use. Vaporella Vertical Styler treats even the most difficult garments comfortably at home, without the need to go to the laundry: coats and jackets can be refreshed in a few minutes, brightening up the fabrics and eliminating the smells of smoke and food; embroidered, embellished and pleated garments can be easily smoothed, delicately removing the folds with the steam. You can also treat home textiles such as cushions, curtains and tablecloths, smoothing creases and eliminating bad odours. 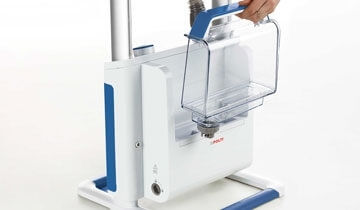 The particular shape of Vaporella Vertical Styler allows easy storage: the extendible tubes can be shortened, the steam hose hung on the special hooks. The base, square and thin, reduces the space taken up to a minimum. Suitable for thick and resistant fabrics; the bristle insert allows the fibres of the fabric to be opened, and the steam to penetrate deeply.